Submitted by Alexander Briones on Mar. 19, 2018. The sub $500 price range is the sweet spot where you can find many guitar amps with good value and overall quality. Here we look at the best of these market leading combo amplifiers, to help you in your pursuit of great guitar tone and functionality. We've divided our recommended list into two sections, first of which features the best solid-state guitar combo amplifiers, while the second section highlights what the best tube amps - all within the sub $500 price range. These are top rated solid-state amps that trumped others in terms of quality and value for money. One common denominator among them is that they all have amp modeling, in one form or another. 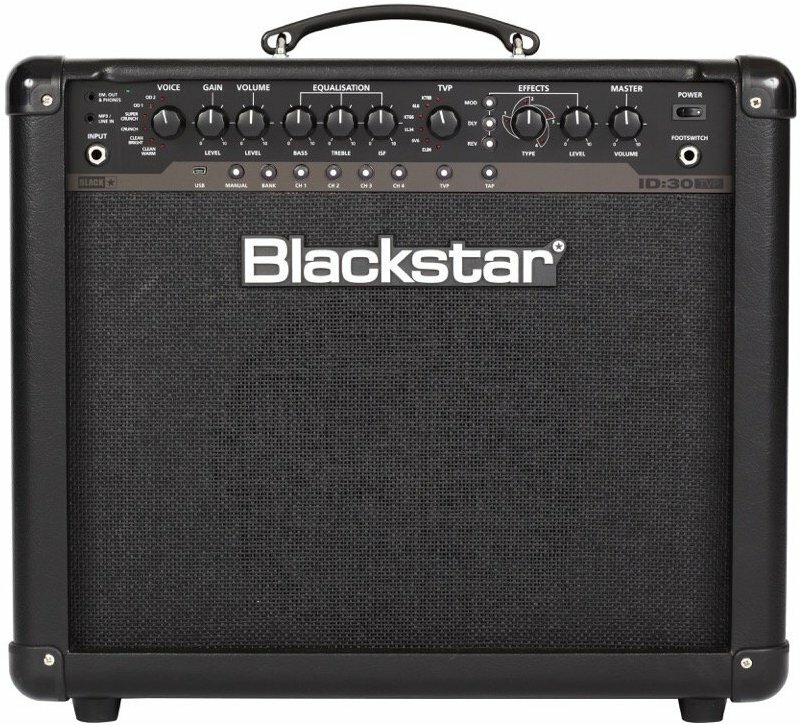 The Blackstar ID:30 TVP is a portable 30W 1 x 12" combo amplifier with interesting features and sonic versatility. TVP stands for Blackstar's "True Valve Power", which lets you switch between different virtual poweramp valves to vary the response of the amp. It lets you choose between 6V6, EL84, EL34, KT66, 6L6 and KT88, with each one adding varying tube like coloration and characteristics to your tone. In addition, the ID:30 TVP comes with six different preamp flavors: Clean Warm, Clean Bright, Crunch, Super Crunch, OD 1 and OD 2. Wrapping up its versatile tone shaping is Blackstar's ISF knob, which lets you transform your sound from punchy American amp flavors to scooped UK amp style tones. And if that's not enough, it even comes with essential modulation, reverb and delay effects built into the amp! All these features, along with its EQ, deep software editing, and built-in presets allow for complex yet convenient control over the amp. It also comes with a USB port for direct to computer recording, along with other convenient features like aux input and speaker emulated output. Response to the Blackstar ID:30 TVP is overwhelmingly positive, with many commending the amp's versatility and overall performance. Many are also amazed at how complex tone shaping features are accessible via intuitive controls, making this amp flexible yet still easy to use. And while most users are into its high gain tones, there are some who are just as happy with its other voicings. Paul White of Sound on Sound is impressed with its tube-like feel, saying: "To my ears, the ID:30 TVP gets extremely close to the experience of playing through a good valve amp, with a great sense of headroom and touch sensitivity." There are a few users who are not impressed with the amp's built-in effects, while others are looking for more EQ controls. Still, even those who have qualms are impressed enough to commend the amp's overall quality and value for money. With its flexible tone shaping options, intuitive controls and great tone, it's easy to see why the Blackstar ID:30 TVP gets a lot of user and expert recommendations. 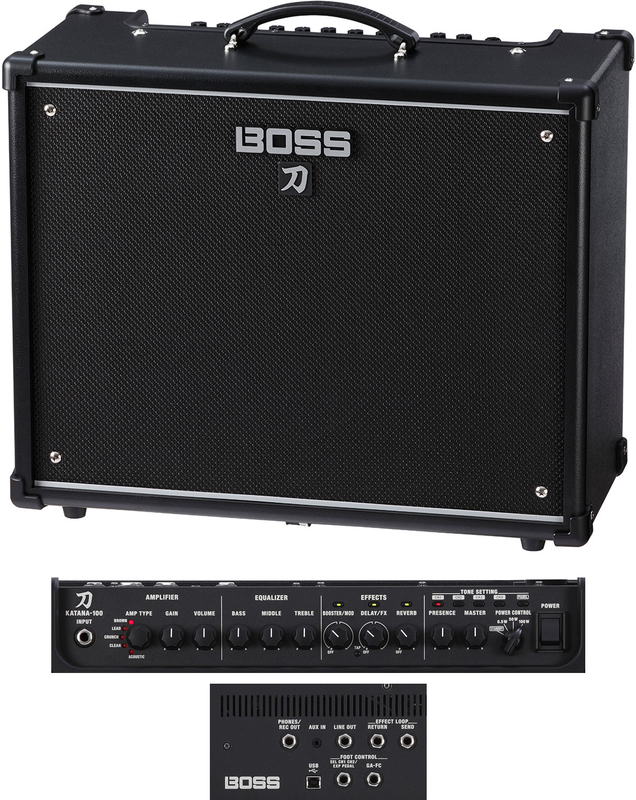 Boss secures a spot in this list with the Katana 100, a 100 Watt combo amplifier with built-in DSP (digital sound processing) and power attenuation. Its coolest feature is its power attenuator, which lets you lower the power rating to half (50W) and can even go as low as 0.5W. This feature allows you to drive the amp harder at lower volumes, making it ideal for practice and recording. This feature works in conjunction the amp's multiple voicings, which includes standard Clean tone and various shades of overdrive - Crunch, Lead and Brown (high-gain). There's also a nifty acoustic amp mode that is meant to complement acoustic-electric guitars. As expected, this amp comes with digital recreations of Boss' popular pedals, with a total of 55 currently available. Note that you can only load up to 15 effects on to the amp and you can only use up to 3 of them simultaneously. Amp Modeling: 5 Amp "Characters"
Boss' venture into the guitar amp market continues to be successful, thanks to the the Katana 100, with its high ratings. Experts and users alike are impressed with its tone, with many specifically mentioning its clean and slightly overdriven tones to be its best. Art Thompson of Guitar Player Magazine is impressed with the amp's response, saying: "There’s good touch responsiveness on the higher gain tones, and these 100-watters are definitely capable of holding their own in a band." Coming from Boss, many are also happy with the amps built-in effects, while those who already own pedals report that the amp works well with stompboxes and guitar processors. The amp's built-in attenuation also adds to the overall value of the amp, making it useful for smaller venues and even for low volume practice. There are some who find the amp a bit lacking in terms of features, like having more amp model options. The limit of up to 3 effects simultaneously also got a few users scratching their heads, wishing that the amp could do more. If you're looking for a loud solid-state amplifier with Boss' brand of quality and reliability then the Katana 100 is perfect for you. Behind its old school silver grille cloth front fascia, the Fender Champion 100 is a value packed amplifier that combines power with nifty features. To start off, it has a 100 Watt amplifier section that drives 2 x 12" speakers, more than enough for most venues, while keeping the price tag reasonable. The amp's first channel is based on old Fender Blackface clean, while the second channel lets you choose from 16 different amp voices, from overdrive to high octane distortion. It also comes with 16 effects that expand your tone options even further. To better accommodate existing guitar rigs, Fender equipped the Champion 100 with effects loop connection. True to its label, the Fender Champion 100 is a true champion in the market, with many users rating it highly for its sound quality and value for money. As expected, it gets a lot of thumbs up for its authentic sounding Blackface clean tone, while others are especially fond of its overdriven tone. The amp's solid build and vintage style aesthetics also impressed experienced guitarists who prefer classic looks. There are some complaints about the lack of an extension speaker output. Some experienced players wanted a dedicated reverb knob to complete the amp's old school controls. The Fender Champion 100 is an old school looking amp that can go toe to toe with most modern amps in this price range, be it in terms of features or sound quality. The Line 6 Spider Jam is true to its name, a guitar amplifier that's meant for convenient jamming, be it with a band, or on your own by playing along with the loops you created, or with the amp's loaded jam tracks. At its core is a 75 Watt solid-state amplifier that drives a distinct PA speaker like configuration, having a 12" Celestion speaker and a 2" tweeter. Being around a decade old now, the Spider Jam comes with fewer tones than what we are used to now. Still, the 12 amp models and the built-in effects should be enough to approximate most popular guitar styles. Other features include an XLR mic input, built-in looper and student-friendly "jam" function. 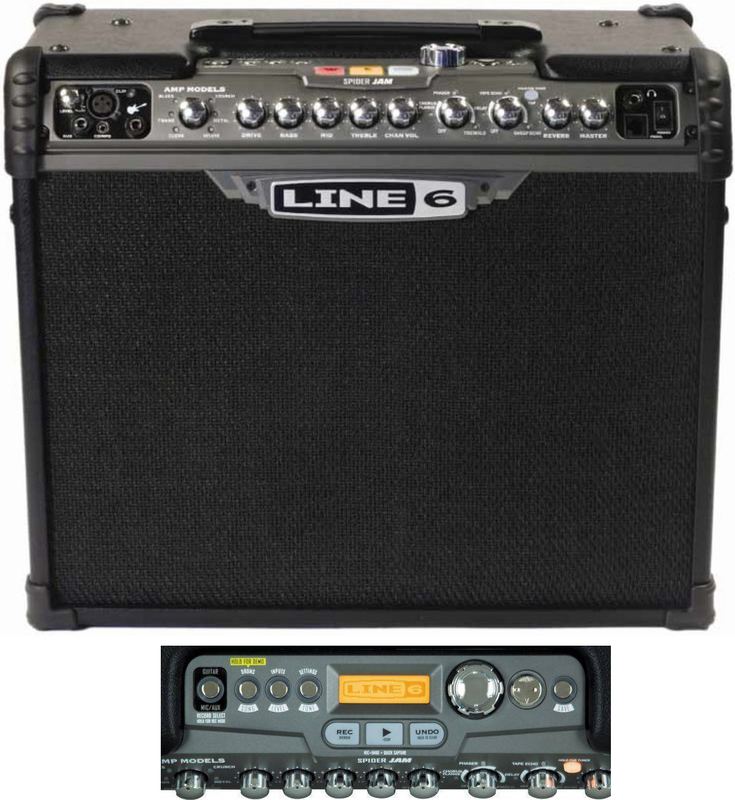 For something equipped with old tech, the Line 6 Spider Jam is still doing well in the market. It continues to gather positive reviews mostly from guitarists who appreciate its practice friendly looper and jam features. Even Trevor Curwen of Music Radar was pleased with its versatility, saying: "It would take a very long time for any user to tire of what it has to offer." Sound quality is also commended often, thanks to its full-range speaker setup. There are a few who are not impressed with some of the amp voices, with some pointing specifically to its high gain tones as being problematic. Some experienced users also caution that the built-in effects are too limited. Check out the student-friendly Line 6 Spider Jam if you're looking for something with built-in looping and jam along features. The tube amps that are ranking well in this segment are those that have great tone, portability and are practice friendly. 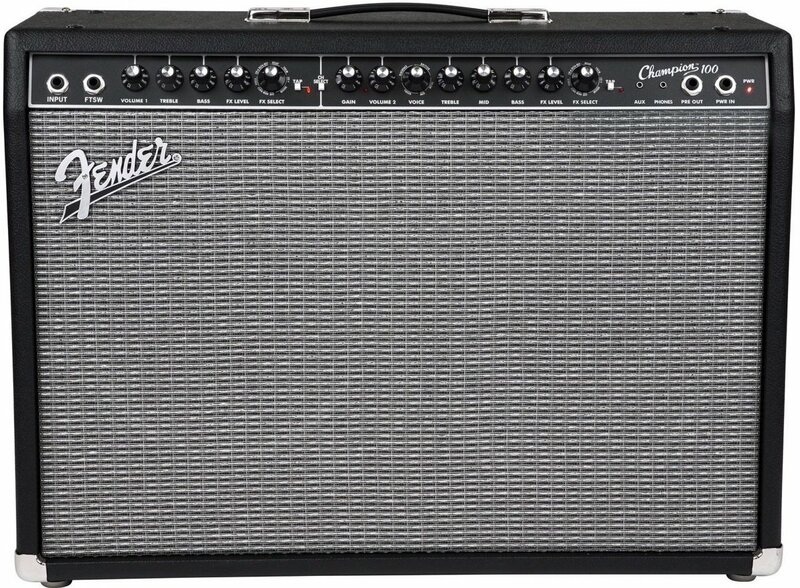 Traditional tube clean tone meets modern amp modeling and digital effects inside the compact Fender Super Champ X2. This 15 Watt amplifier starts off with the familiar Fender clean tone in its first channel, courtesy of its 12AX7 preamp tube and dual 6V6 output tubes. Switching to the second channel gives you more tone options, from subtle grit to high gain overdrive, via the amp's voice knob which gives you a total of 16 different amp voicings. In addition, this tube amp comes with 15 essential effects built-in, which you can configure quickly via a single knob. While the amp's hardware interface is limited, you can expand your tone palette by connecting the amp via USB to a computer and editing the voicings and effects through the amp's software editor. Reviewers have mostly good things to say about the Fender Super Champ X2, especially when it comes to clean tone. So much so that for some, the ability to switch voices is just a nice plus to the already good base tone that the first channel provides. The amp's versatility and portability are also lauded by many, with reports of it working well in small gigs and recordings. Some users are not impressed with the stock 10" speaker, they recommend swapping it out with something from Celestion or Eminence, for a fuller and warmer tube sound. 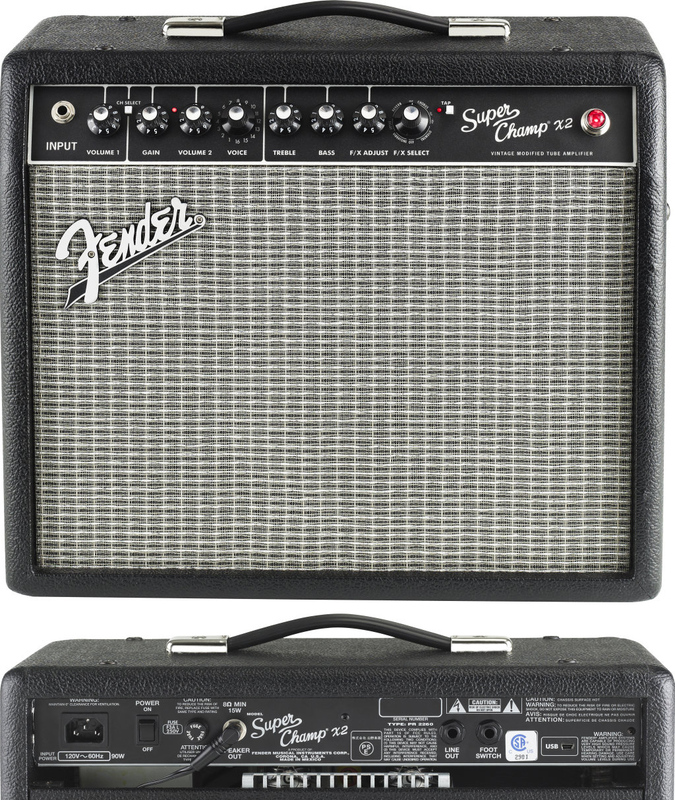 The Super Champ X2 gives you classic Fender tube tone with a bit more flexibility and functionality, ideal for players who want a versatile and compact tube amp. The Vox AC10C1 is as straightforward as it gets, a true vintage style tube amp with none of the complications of modern amp modeling. At the core of this small combo is a 10 Watt amplifier with two 12AX7 preamp tubes and two EL84 tubes, designed to reproduce genuine Vox AC15 and AC30 tones, albeit at more manageable volume levels. This includes Vox' "Top Boost" circuit which helped mold the "jangly" sound of many iconic British artists. Giving this amplifier its sound is a single 10" Celestion VX10 speaker, which complements the amps familiar voicing and closed back cabinet. Thankfully, Vox added a built-in reverb into the amp, along with a 2-band EQ for a bit of tweaking. 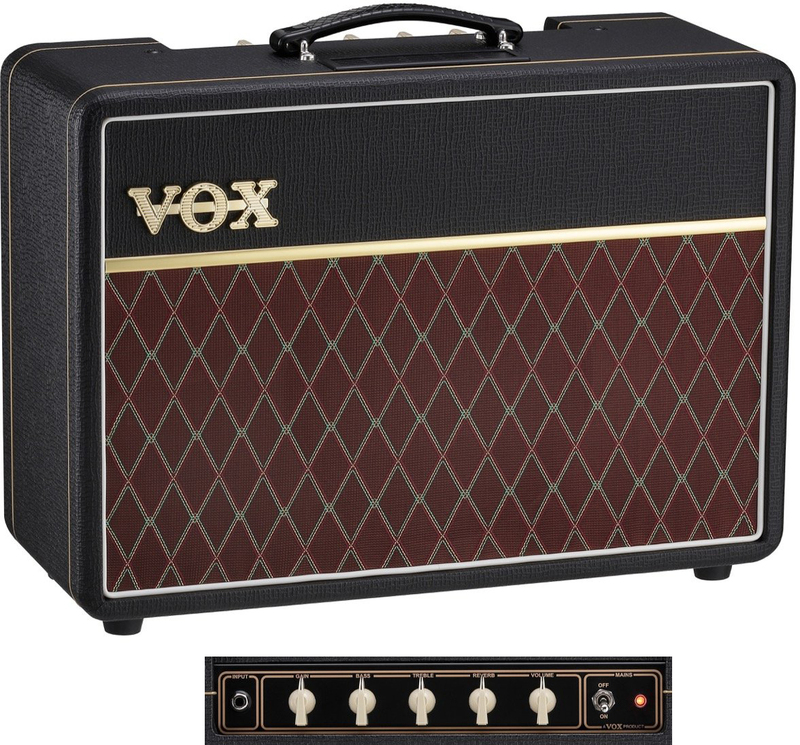 Beautiful, wonderful, great and many other positive adjectives are used to describe the Vox AC10C1's tone. Users are impressed with its sound quality, and even experts find it hard to find fault with its sound. Charles Saufley from Premiere Guitar says that "the AC10 could be the ultimate amplifier for laying down power pop rhythm tracks. And it’s devastating as a lead machine with volume and gain controls up high." Build quality and portability also got a lot of thumbs up. There are a few users who feel that the amp is overpriced, and they feel that some extra features would've added to its value. Note that this amp can sound very bright, especially when paired with single-coil equipped guitars, so if shimmer, chime and jangle are not your cup of tea, then the Vox AC10C1 is not for you. Those who are looking for classic Vox tones will definitely love the AC10C1. Stevie Ray Vaughn, Eric Johnson, Steve Vai, John Petrucci, Carlos Santana and John Mayer are just a few of the many major league guitarists who utilize the Tube Screamer pedal to drive their tube amps. 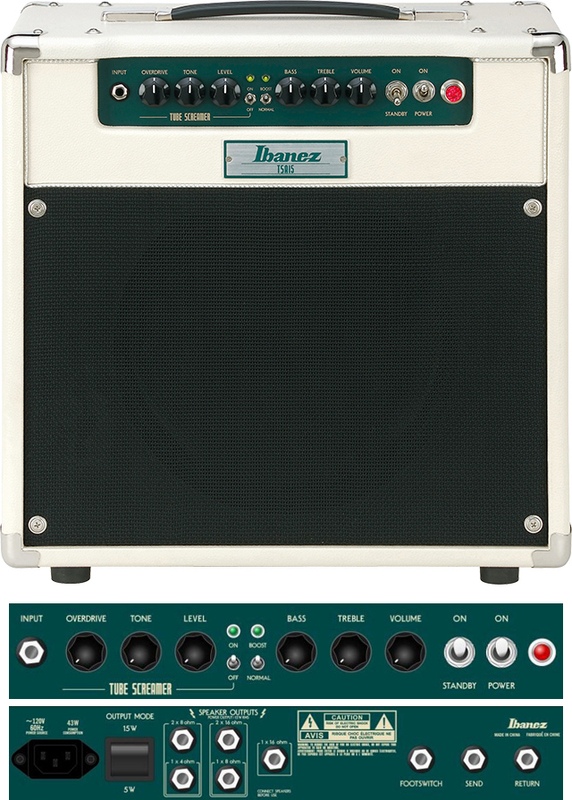 With the pedal's popularity, Ibanez decided to combine the circuit of the famous "green" pedal into a tube amp, resulting in the TSA15. This means that you can readily drive the preamp section (which features a pair of 12AX7 tubes) right on the amp itself. The amp also features a pair of 6V6 power tubes for a true all-tube tone. For the speaker, Ibanez opted for a branded 12" Celestion Seventy 80, which is described as having punchy and aggressive upper midrange response. Other features include a 6 dB boost switch, and a built-in 5W power attenuator that lets you run the amp at quieter levels. As expected, most of the users are impressed with its sound, from the subtle grit of its clean tone, to its cutting bite when driven hard. While it's understandable that most use this amp for blues and rock style songs, it's surprising to find that there are some who love it for clean jazz styles. The amp is also liked for being pedal friendly, be it through the front input, or via the effects loop at the back. The ability to turn down the power to 5W also got a lot of commendations from users who want inspiring tones at lower volumes. Being a compact 15W amp, there are some users who find that the amp does not have enough volume for band use, especially when playing with a loud drummer. The lack of reverb also came up in some reviews. If you're into the SRV Tube Screamer style tube tone, and you're looking for a compact amp that can do just that, then get the Ibanez TSA15. It's interesting how tube technology, which is now many decades old, still persists in this modern era - many thanks to guitarists who love the sound of tube amps. The sound, feel and response of tube amps are generally regarded to be better than solid-state, but since they utilize fragile tubes, they are typically more expensive and require more handling care and maintenance. On the other hand, solid-state amps are more reliable and affordable. Thanks to improvements in digital sound processing, these amps are also getting ever closer to nailing the feel and sound of their tube counterparts. Those who looking for something practical that can get the job done will appreciate solid-state amps, while those with picky ears will want no less than a genuine tube amp. Power rating describes the loudness of an amplifier, so generally speaking, the higher the power rating, the louder amp. Those who are looking for a stage amp will want something loud. But it's not always about being loud, because most situations call for lower volumes, especially when practicing at home, hence the availability of low wattage guitar amps. This is also the reason why some amps come with built-in attenuators, which allow users to drive the amp hard at lower volumes. Note that some tube amps tend to be louder than similarly rated solid-state amps. Speaker size also affects overall loudness, but even more so, it affects the sound clarity. Smaller speakers tend to emphasize the mids, which complements most guitar styles. On the flip side, there are guitarists who prefer the added bass emphasis of wider speakers for a fuller sound. Made possible by improvements in Digital Sound Processing (DSP), more and more manufacturers and guitarists are embracing the convenience and versatility of amp modeling. Some even go so far as to allow complex customization of virtual amp components. While having more tone palettes is good, having too much of a good thing can be bad for some. If you're into sonic versatility and personalization then you'll want one with more features. Those who prefer plug-and-play convenience will prefer those with fewer options and controls. Reverb is the most common effect added to amplifiers, because of how it adds space and texture to the sound. Some amps come with other effects, but they are usually limited in terms of function and controls. Some frown on the quality of these extra effects, but others appreciate the practicality and convenience that they offer. If you are planning to use your amp on stage or for recording, extra connectivity features will help greatly. Those with speaker emulated outputs allow for direct connection to PA systems and recording consoles. The ability to play quietly via headphones is also a nice plus, especially if you're looking for a good practice amp. Some of the recently released amps feature USB connectivity for direct recording and software control, while others even come with Bluetooth technology, which allows for convenient wireless audio streaming straight to the amp.